There's immediate peat smoke on the nose, complemented with notes of burnt rubber, seaweed and chimney soot. Behind that delicate vanilla emerges, followed by a pleasant sweetness of crisp malted barley with gentle medicinal notes in the background. Rich and powerful. A pleasant sweet start on the palate with vanilla, malted barley and lingering yellow fruit - lemons and apricots in particular. This is immediately followed by a warming spiciness of black pepper, oak, cloves and allspice, accompanied with lingering peat smoke. subtle iodine and roasted flavours. Nicely mouth-coating. The finish is long, warm and tender sweet with vanilla, honey and hints of oranges. Notes of pepper, allspice, and a whiff of maritime flavours in the end with gentle cold peat smoke overall. Water tames the power of this malt with less notes of peat, smoke and maritime flavours. The lovely sweetness on the palate is reduced with water, bringing more dry oak, medicinal notes and smoke to the fore, while crisp malted barley lingers towards the finish. The finish shows medium length with a warming mix of spiced oak, cloves and creamy vanilla in the end. Typical Laphroaig. Powerful, lively, more smoky than seaweedy. 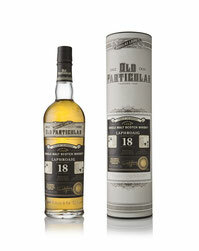 An excellent mix of sweet, fruity, peaty and spicy flavours. Very well balanced, complex and mouthfilling. Not the big phenolic giant but beautifully mature and sophisticated. Definitely one for the hip flask whilst sitting on the dock of an Islay bay. Highly drinkable with absolutely no need of water here!